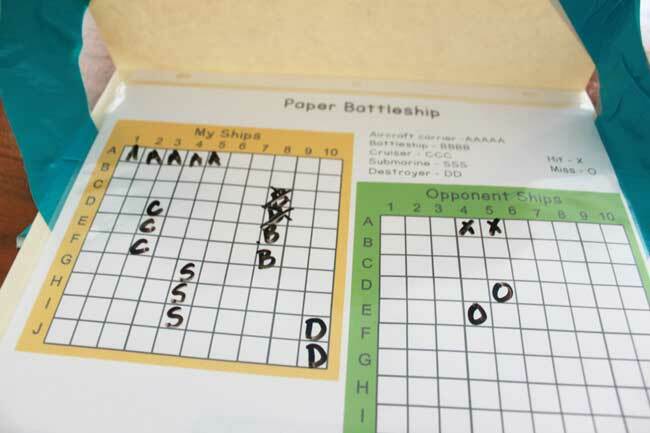 Paper battleship is played the same way as regular battleship, but you have paper grids, and you have to use a pencil (or dry erase marker) to mark where your ships are, and where your hits and misses are. Each player needs two grids on the inside of a file folder. 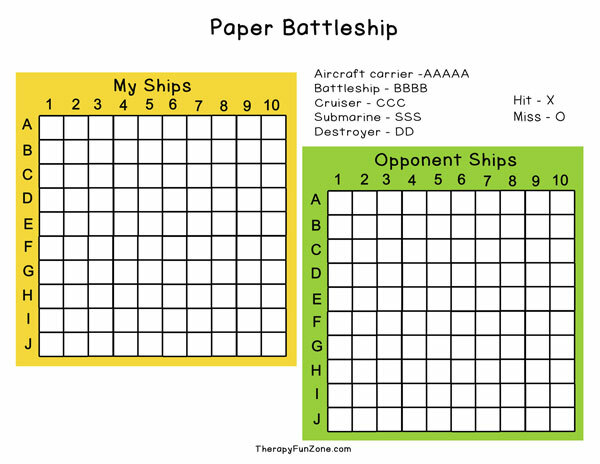 You could laminate them and use dry erase markers, or just use a new paper grid each time you play. The grids have numbers across the top and letters down the side. I put duct tape at the corners of my file folder to hold it open while playing and make sure that the players can’t see the other player’s grid. 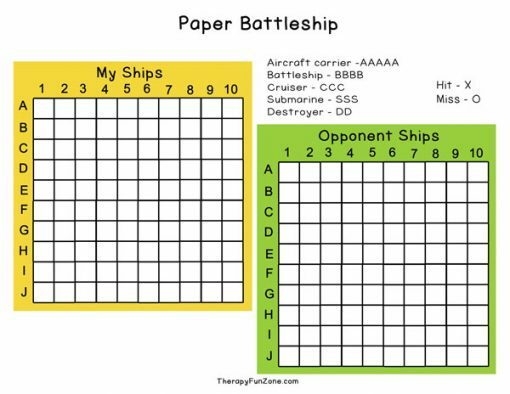 On one grid, you mark out the spaces that your ships are in. Then you play the game by calling out the grid coordinates and making an x in spaces that are hit. You could use different colors for hits and misses, or use X for hits and O for misses. I think it would be fun to make the battleships out of play doh too, and place them on the spaces. I would make a little play doh ball for each square of the ship. Then you can squish them with a finger when they are hit. To practice more writing, you could have all the misses require the student to write a random alphabet letter in the square. I have included both a color version (for laminating or putting in a sheet protector and using dry erase markers) and a plain black and white version for printing lots of and using a pencil with.